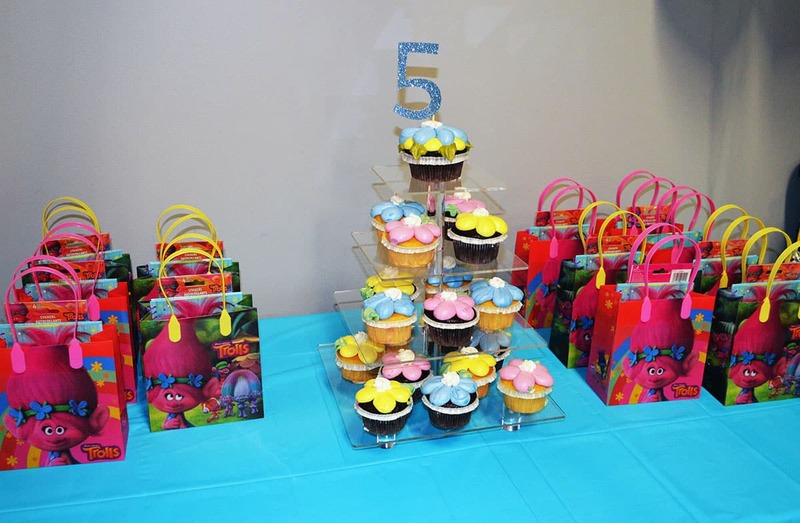 Trolls themed parties are extremely popular right now! Trolls birthday parties are so popular that I could not find any party supplies in stores. No need to fret, Amazon.com to the rescue! On Amazon I was able to find most of the newer, Trolls movie themed items. Keep looking below because I came up with a couple (simple) ideas that put a huge smile on all the birthday party attendees. I’m all about sugar, but artificial coloring is something my family just can’t do (sensitivities). So here I have white chocolate pops made using natural plant based dyes (by India tree) to add a bit of pizzazz. The adorable molds were found on amazon.com (click here for link). The bright bold colorful bucket I actually found at Target around Easter time. Inside that bucket I places a round styrofoam ball that I found at my local craft store. Added a little shiny green grass and voa la a beautiful, tasty center piece loved by all the adults and children at the party. Clouds On A Stick, another huge hit! Now this one is ridiculously easy… I call them clouds on a stick. 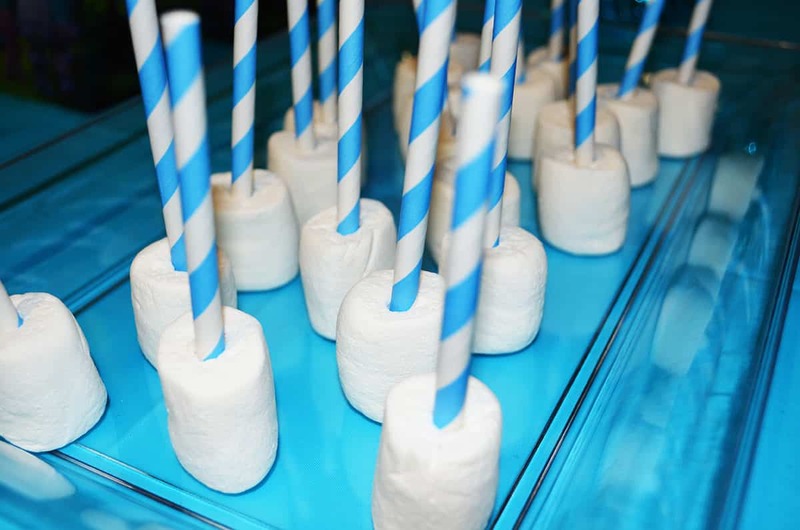 Yup, just stuck that whimsical paper straw that I cut in half right into those marshmallows and Voa La. Seriously, who doesn’t love marshmallows!? By placing the marshmallow on a stick and giving it a creative name all of the sudden it becomes a magical treat. One little friend at my sons party just could not stop eating these and had to take them home to share with her entire family (she was too cute!). These amazing flower cupcakes were made by my local Whole Foods Bakery. As requested, they made one of the flower cupcakes larger and a bit more intricate for the birthday boy. Then placing the gorgeous flower cupcakes onto this simple tier stand really made them stand out. The tier was another amazon.com find (Link here). Again, I choose this bakery because all their dyes are plant based and natural, but also so unbelievably delicious too. 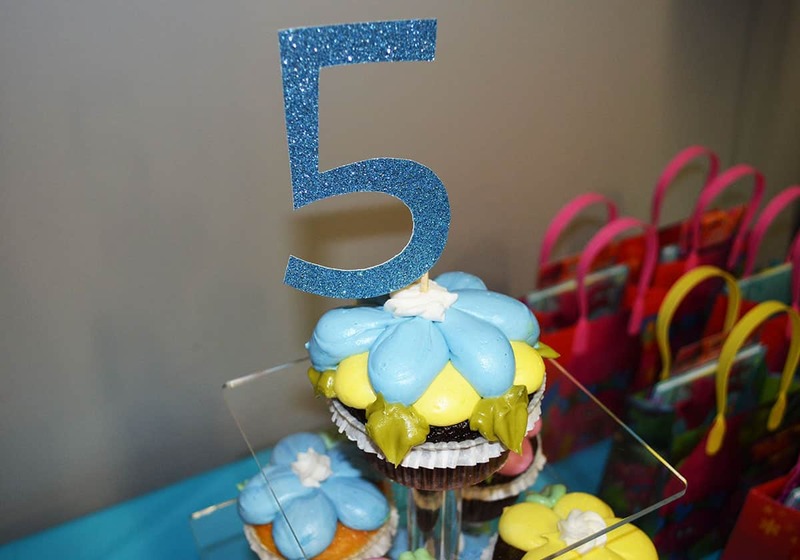 On top of the stunning flowered cupcake tier is a little reminder that the Birthday Troll was turning 5! This glittered cupcake topper was very easy to make. Simply gather your supplies; a numbered stencil, pencil, scissors, glue, wood stick and glittered card stock of your choice. After assembling you numbered cupcake topper relax knowing the cupcakes are being handled by the professionals at the bakery. Our little guest had a blast scooping their Troll Bait a.k.a. 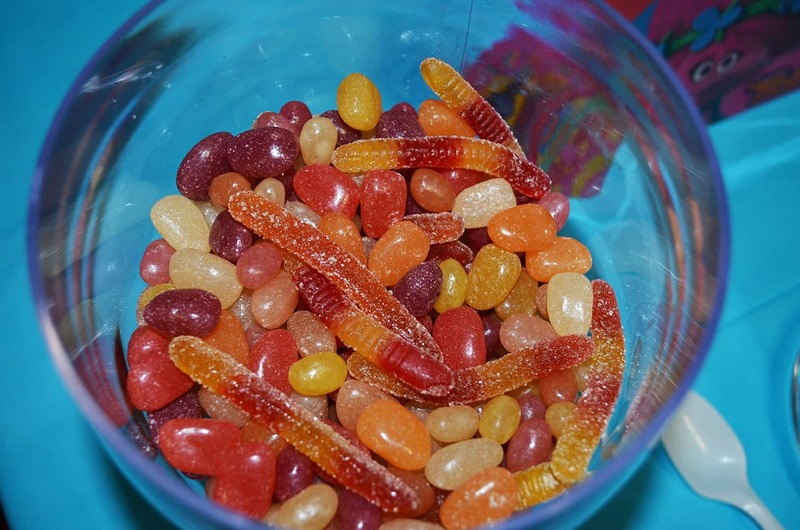 jelly beans and gummy worms into the cool neon colored cups we had. This idea really came together last minute when I realized that in my pantry remained new bags of jelly beans from Easter. I just could not let the candy go to waste (or my waist 🙂 ) and became determined to find a purpose for them. I was elated that this Troll Bait idea was such a huge hit and very simple to make. This very special birthday was held at a local kids play place and also my first ever school party that I’ve hosted. Over all it was a huge success and my little guy was over the moon excited that his friends were a part of his special day. 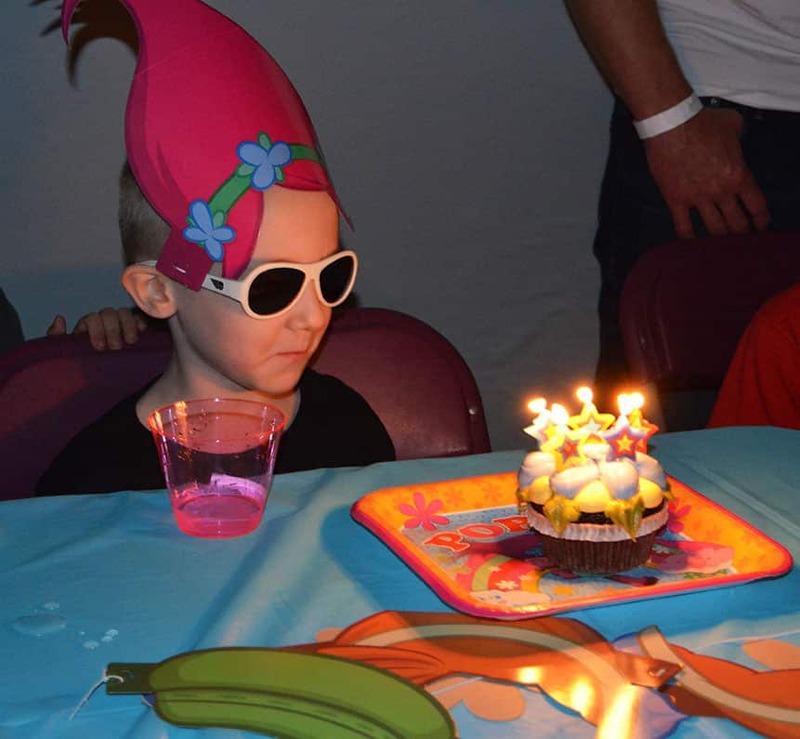 I had to zoom in and crop out Maxwell’s friends just to show you a picture of the birthday troll and his cute star candles as we all sang Happy Birthday to this shy guy. The birthday hats were too stinking cute and all different kinds of Trolls hair. Of course my son wanted to be Poppy his favorite Troll (click here for Trolls paper headband link). 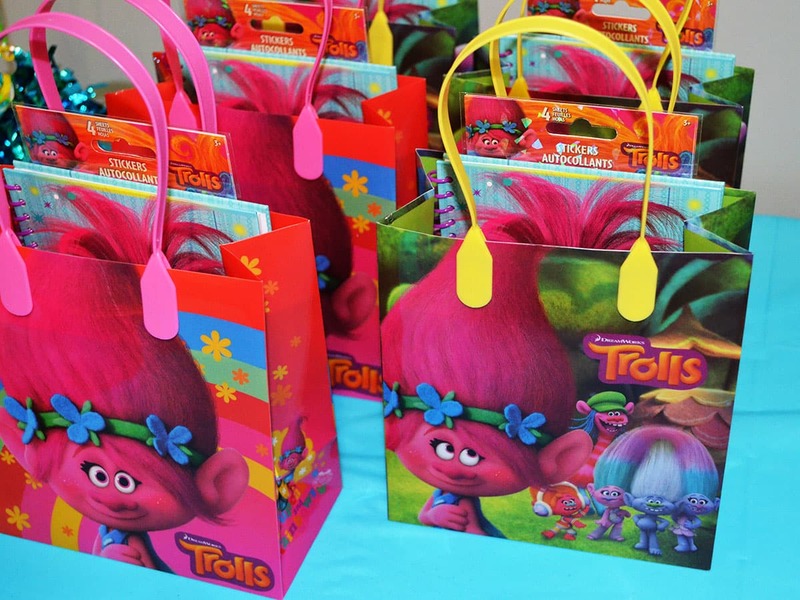 Last but not least, we have the Trolls treat bags. Inside these goodie bags were Trolls stickers, notebooks, pens, stamps, suckers and one very special gift from Maxwell, a pair of sunglasses for all his special friends. Everyone who doesn’t know Maxwell assumes he wears sunglasses for different reasons, but it’s actually because he is severely light sensitive. Maxwell’s light sensitivity has been present since birth. My son loves his sunglasses and wanted to share a pair of shades with all his buddies, how cute right! 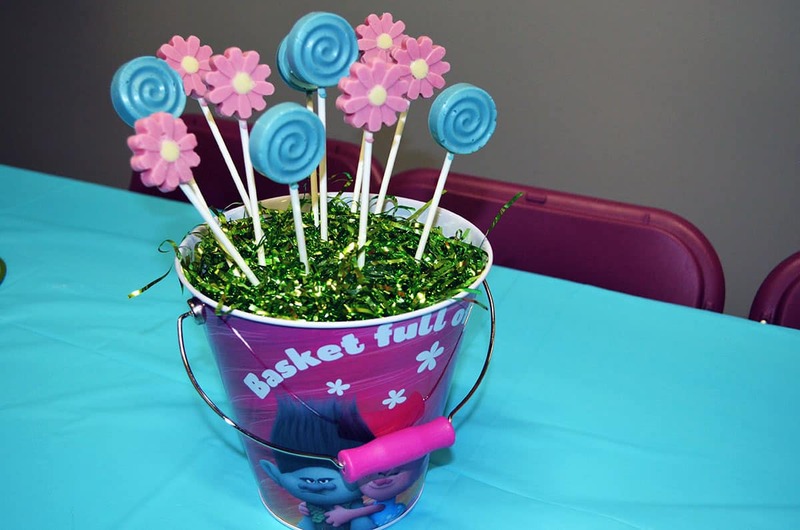 I hope this birthday post inspired you to have a Trolls Themed party of your own with adorable Clouds on a stick, Trolls bait and flower cupcakes for everyone!